The game-winning play for Oregon State contained two officiating errors, but the Pac-12 Conference would not accept Lorenzo Romar’s laments on the episode that likely did in UW’s NCAA tourney chances. It was reported by ESPN that UW coach Lorenzo Romar had a formal protest with the league, but the league said it had no formal protest policy. Romar told The News Tribune that he did call to complain. Since Thompson’s shot left his hands with 0.7 seconds left, the clock delay could have provided the time difference. Game officials reviewed the replay after the buzzer and said the shot was good. There was no chance for a reversal of the outcome, but there was at least a chance for a little justice. 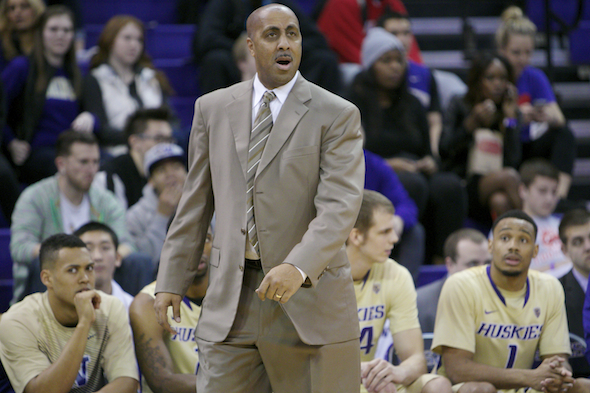 “The whole point is that you’re talking about a potential NCAA tournament berth,” Romar told the News Tribune. “You’re talking about kids busting their tail, playing their tails off, giving it everything they have, like both teams did. “But when something like that happens . . . it’s not even about discussing if the clock started late, or if there was a travel. It’s not even about that. That’s a foregone conclusion. I’m sure those involved saw that, OK, yeah, there was a travel. OK, yeah, the clock . . . that was just pretty cut and dry. The Huskies are 16-12 overall and 8-8 in Pac-12 play, which means that even beating Oregon Sunday and Washington State Wednesday at home in the regular-season final is unlikely to provide them the boost to get into the 68-team tourney field as an at-large team. They would have to win the Pac-12 tourney to gain a berth. Losing to OSU – geeez – they are crap, nationally, so that makes the UW crap, nationally, again. Romar just isn’t the leader who will ever get the UW consistently into the top 25, let alone the post-season. No wonder challenge was denied! Woodward had no UW ties when he came here with Emmert. And being a non-UW person doesn’t make a candidate better or worse. Good point Art – Given the turnover Woodward had with most of the coaching staff, which he elevated greatly, then there must be a “hands-off” rule with Romar. As to a non-UW person, if the next AD is brought in with eyes wide open and the authority to hire/fire, replacing Romar would be at the top of the list. All other sports are well represented, to my knowledge. Other than his failure to replace Romar, Woodward clearly goes down as one of UW’s best AD’s, if not the best. The UW is just not a basketball school. The by-products which emanate from that fact have been on full display now for many years. Huskies desperately need to set up a campus brothel to show this is a basketball school. Well, it might help with recruiting. Ha Ha!! Rick P should be available very soon. The clock started a second late and Thompson blatantly traveled. Whether they’re the Pac-8, Pac-10 or Pac-12 the conference officials have always been under par compared to refs in the ACC, Atlantic 10 and other big name conferences. Of course they’re underpar to the ACC. The ACC has superior teams and superior refs. The Pac-12 in basketball hasn’t had a Final Four team since 2008 and hasn’t had a national champion since 1997. Even more embarrassing, in 2012, the dawgs won the Pac-12 regular season title and were left out. That happens to conferences like the WCC, shouldn’t happen to a power 5. It’s amazing any of us around here can go out and be seen in public. It isn’t enough for you that they a majority of the calls right? I question if Duke, North Carolina or Kansas would have been ignored in the final call as the Huskies were. Considering Coach Romar did file a protest I think questioning the officials is justified. Watched the tape of the game and the OSU player definitely moved the ball to 1/4 court before the clock started. So not sure what Pac12 was looking at. Made them look more foolish to say they looked at it and saw no issues. Having said that, we should close a game where we have a 6 point lead with 69 second to go and definitely don’t allow a shooter to go the length of the court and get a shot off on the last play. Cost us a chance to go to the tournament. ❝my .friend’s mate Is getting 98$. HOURLY. on the internet.”….two days ago new McLaren. F1 bought after earning 18,512$,,,this was my previous month’s paycheck ,and-a little over, 17k$ Last month ..3-5 h/r of work a day ..with extra open doors & weekly. paychecks.. it’s realy the easiest work I have ever Do.. I Joined This 7 months ago and now making over 87$, p/h.Learn. More right Here:;/121➤➤➤➤➤ http://GlobalSuperEmploymentVacanciesReportsJobs/GetPaid/98$hourly…. .❦2:❦2:❦2:❦2:❦2:❦2:❦2:❦2:❦2:❦2:❦2:❦2:❦2:❦2:❦2:❦2:❦2:❦2:❦2:❦2:❦2:❦2:❦2:❦2:❦2:❦2:❦2:❦2:::::;/121.. It doesn’t help the Conference’s credibility when it closes ranks to protect the refs like this. Same sort of gyrations the NFL goes through. You could argue that the delay in starting the clock MIGHT not have been long enough to make a difference (although from my vantage point it was). You cannot argue that the OSU player did not travel as that call is defined. It is insufficient to say “a travel call is a non-reviewable judgement call,” full stop. What if the dude had taken 6 steps, instead of 3 or 4? At some point you have to say–“we can’t change the outcome under the current rules, but the ref blew this one.” But this “move on, nothing to see here, everything was fine” meme so common in sports can be ridiculous. Anyone who’s watched Pac-10/12 officiating over the years is not the least bit surprised by any of this.